Located 45 km from Gua Musang, Homestay Jelawang is just a few minutes’ away from the tallest waterfall in Asia, the Stong Mountains. Having the Stong Mountains as one’s own backyard, is certainly a refreshing experience. The cooling mountain air wanders slowly to the village, and there is much to explore for mountaineers’. It is the many varied activities here that capture the essence of the place; catching fish at Kelantan River, climbing Stong Mountain, jungle trekking and visiting the fruit orchard’s when in season. The villagers’ plant durian trees, pineapple, duku, rambutan and bananas. Sample too, the delicious cooking by the villagers; spicy laksa, delicious pengat pisang and cooling coconut drink. They’ll be delighted if you ask for seconds! Warm and friendly hospitality, wake up to the greatest sunset over the mountain tops, with the call of the morning rooster. 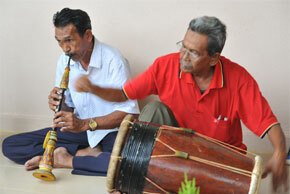 Join the village folk in their daily routine, and try a hand at rubber tapping. Watch as the rubber sap slowly falls, drop by drop to a plastic cup below. Savour the moment, and enjoy your time learning more of the life in the slow lane. Here, life is run differently, offering a glimpse into a colourful Malay homestay experience, away from the hustle and bustle of city life. 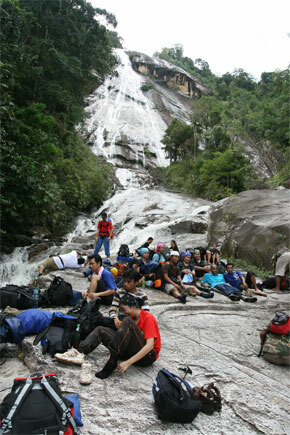 The Jelawang Waterfalls, one of the highest in Malaysia, is a characteristic feature of Gunung Stong State Park. Visible from miles away, there are numerous other (but smaller) waterfalls as one ventures deeper within the State Park. Located in south-west Kelantan in the district of Kuala-Krai, the Gunung Stong State Park is slowly earning a reputation as a budget outdoor recreation and nature destination. Attracting mountain climbers, jungle trekkers, bird watchers, cavers and outdoor lovers looking for an "off-the-beaten track" adventure - Gunung Stong State Park has the elements of an exciting experience.